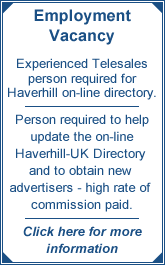 The bestofhaverhill will hold its next business meeting on Thursday, November 15, at Days Inn, from 10am to 11.30am. Continuing its theme of Wanting The Best For Haverhill this month will be guest speakers the Rev Malcolm Hill and David Edwards, the chair and vice-chair of the Cambridge to Colchester Rail Project. Malcolm and David will give an update on their proposals for an engineering feasibility study and are keen to hear the views of local businesses. The meeting will be chaired by Paul Donno, vice-chair of Haverhill Chamber of Commerce and director of Jacobs Allen Chartered Accountants and Chartered Tax Advisers. MPs, local authorities and business associations have been invited to the event to participate in the discussion. Elaine Carr, owner of thebestofhaverhill said: “A railway for Haverhill is certainly an emotive subject. The issue was raised, again, at our meeting last month with Ian Gallin the joint chief executive of St Edmundsbury Borough Council and Forest Heath District Council. "Of course money is an issue, especially in today’s economic climate, but what if there is a solid business case to justify the investment? "There are some who are very dismissive of the idea because of the cost and the fact that the original line could not be reinstated in Haverhill so would require a new route. "At the moment we don’t have all the facts so it would seem inappropriate to make decisions that could affect the long-term future of Haverhill based on incomplete information. "I would like to see the Cambridge to Colchester Rail Project given the financial support to fund the engineering feasibility study – which would provide answers to some of the questions regarding costs and viability. "There are over 300,000 people living in the Cambridge to Colchester ‘corridor’ and three local authorities involved – viewed in those terms the cost to fund the feasibility study is just pennies per person. If you would like to attend this free event at The Days Inn, Haverhill, please call Elaine Carr on 01440 710 158 or email Haverhill@thebestof.co.uk by Tuesday 13th November. The event is open to any local organisations and you do not have to be a member of the bestofhaverhill to attend.